July 29, 2008: Tour of the Burke Museum Ornithological Collection led by Kevin Epperly. Sincere appreciation to the BURKE MUSEUM for the opportunity to tour the Ornithology Collections. Sievert Rohwer, Curator and Professor, Emeritus, graciously directed me to his staff for access and information. In particular, I am indebted to Sharon Birks, PhD, Genetic Resources Manager, for her detailed responses to all my questions and review of my photo gallery on SmugMug. Many thanks to Chris Wood, Collections Manager for Birds, for his expert coordination in setting up our tour appointment. A special note of gratitude to Kevin Epperly for taking time out of his busy day to guide us thru the collections and answer a million questions, and still catch his bus. I missed the Passerines, but there is always next time! Lastly, thank you to my friend Richard Jones for being my accomplice on this adventure to the Burke Museum ~ in good cheer as always. 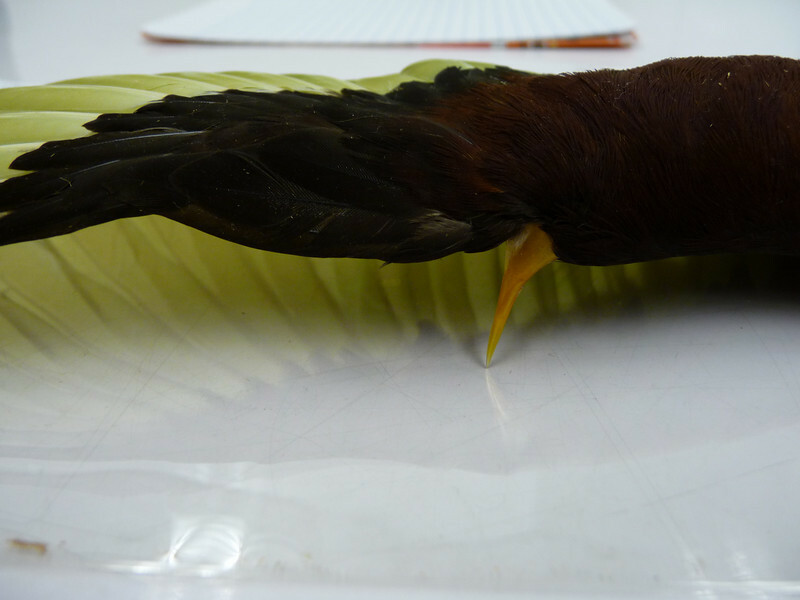 9 - Northern Jacana - sharp metacarpal wing spur - used in confrontations with other Jacanas. BNA: Bright-yellow cornified carpal spur located on bend of wing (projects from proximal end of carpal bones). Pointed spur is elongated and extremely sharp in adults.